While in my slumber, the USGS prepared a moment tensor and another aftershock occurred. Below is an updated map to my initial report here. I plot this moment tensor, which shows a compressional mechanism. I placed a moment tensor / focal mechanism legend in the upper right corner of the map. There is more material from the USGS web sites about moment tensors and focal mechanisms (the beach ball symbols). Both moment tensors and focal mechanisms are solutions to seismologic data that reveal two possible interpretations for fault orientation and sense of motion. One must use other information, like the regional tectonics, to interpret which of the two possibilities is more likely. The Amlia fracture zone is a strike-slip fault system in the downgoing Pacific plate. This earthquake swarm is aligned with the AFZ, though the M 5.9 mainshock has a compressional mechanism. These earthquakes are probably along the megathrust fault interface, but that is speculation since I was not there to observe them within the Earth. 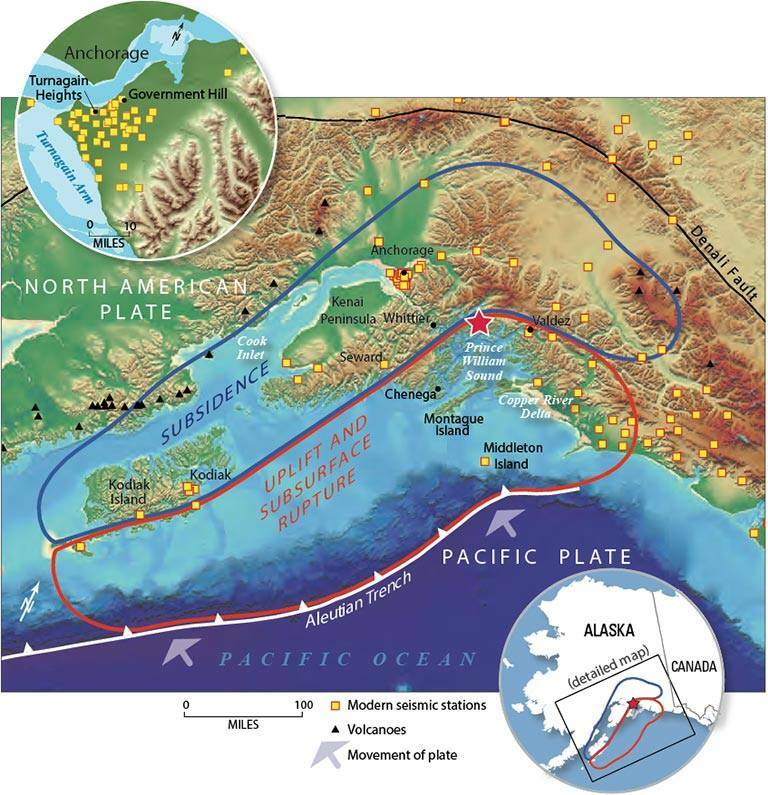 The inset map in the upper left corner is from Dr. Peter Haeussler, USGS, Alaska Science Center, showing the historic earthquakes along this subduction zone. Here is a map that shows the regional extent of the 1964 earthquake. Regions of coseismic uplift/subsidence are delineated by blue/red polygons. This shows a cross section of a subduction zone through the two main parts of the earthquake cycle. 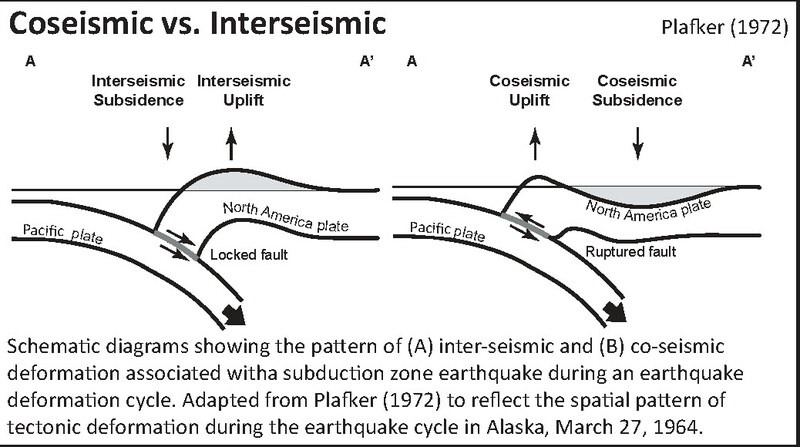 The interseismic part (inbetween earthquakes) and the coseismic part (during earthquakes). This was developed by George Plafker and published in his 1972 paper on the Good Friday Earthquake. Note that there are blocks that are rotating to accomodate the oblique convergence. There are also margin parallel strike slip faults that bound these blocks. These faults are in the upper plate, but may impart localized strain to the lower plate, resulting in strike slip motion on the lower plate (my arm waving part of this). Note how the upper plate strike-slip faults have the same sense of motion as these deeper earthquakes. Here is a video that discusses the 1964 earthquake. Maps from Google Earth. Video from US Army Corps of Engineers. Tsunami animation from National Oceanic & Atmospheric Administration (NOAA). Photographs from US Geological Survey. Plafker, G., 1972. Alaskan earthquake of 1964 and Chilean earthquake of 1960: Implications for arc tectonics in Journal of Geophysical Research, v. 77, p. 901-925. 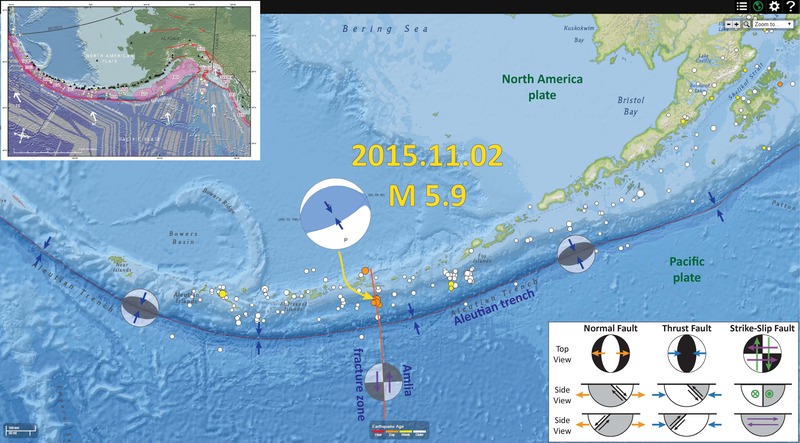 Earthquakes along the Amlia fracture zone!